Job Week card was given out today. 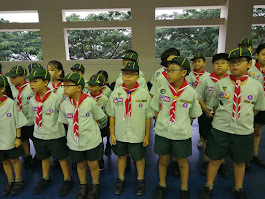 During the Job Week, Scouts will perform a job in order to earn the funds and NOT beg for donation. (The funds raised will be used to finance training and programme activities). If you have not collected the following, please see Mrs Pwee ASAP. 1. Job Week Card (If you lose the Job Week card, you will need to make a police report). 2. Pocket calendar (as gift token for the persons you work for). 3. "Jobs I can do card" (think about what you can do before you approach your relatives or teachers to offer your help). 4. Consent form for STC (1-3 April)/Area Campfire (2 April 2016). Submit consent forms to #115 by the end of this week. Do not leave your money (STC $50, Area campfire $4) inside the cupboard. Hand in your money to the teachers personally.